LONDON, WATERLOO, UNITED KINGDOM, November 5, 2018 /EINPresswire.com/ — As Russia and its military intelligence unit, the GRU, have been accused of a raft of cyber-attacks on targets around the world, senior Royal Navy officials have increased their cyber-space focus more than ever on HMS Queen Elizabeth – 'It is not just about viruses and attacks, it is also about hybrid information warfare' said Commodore Mike Utley [Naval Technology]. 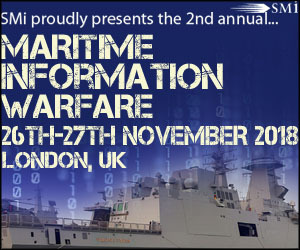 With this in mind, Commodore Ian Annett, Assistant Chief of Staff Information Warfare and Chief Information Officer, Royal Navy and other senior Royal Navy officials, will be discussing cyber warfare and overcoming complex threats at SMi’s Maritime Information Warfare conference taking place on 26th and 27th November 2018, in London UK. Airbus Defence & Space, BAE Systems Applied Intelligence, BAE Systems Submarines, Canadian Armed Forces, Canadian Navy, Deloitte, Digital Authority Security, Finnish Navy, Hexagon Geospatial – Luciad, Mass, NATO MARCOM, Naval War College, Navantia S.A. S.M.E, Portuguese Navy, Radley Consulting, Royal Canadian Navy, Royal Navy, Royal New Zealand Navy, SDL Language Weaver, Sirius Constellation, Spanish Ministry of Defence, Stratbyrd Consulting, University of Plymouth, US Navy War College and more! Registration will be closing in under 4 weeks’ time, for those who would like to reserve their place at this high-level meeting visit www.maritimeinfowarfare.com/einpr, alternatively, contact Damien Howard on 0207 827 6736 or email dhoward@smi-online.co.uk. The latest conference brochure is available to download on the event website, where attendees can also register and receive real-time updates in the lead up to the conference. For delegate queries please contact Damien Howard at dhoward@smi-online.co.uk . For media queries please contact Natasha Boumediene at nboumediene@smi-online.co.uk.